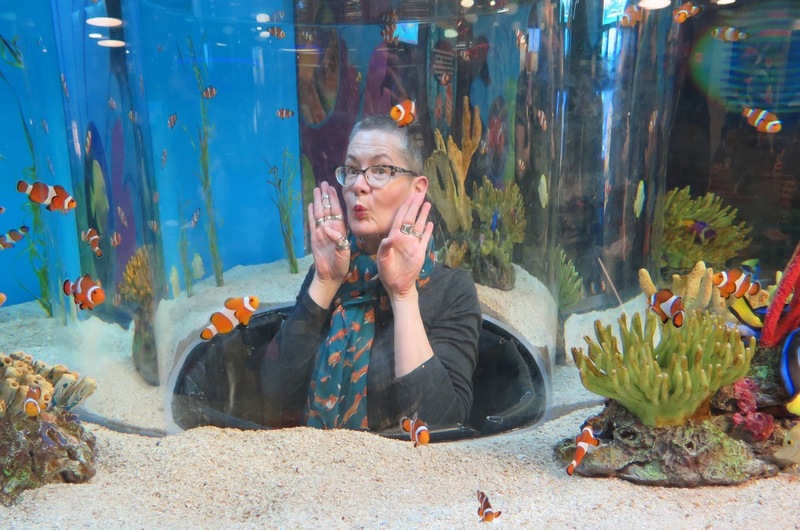 Forest City Fashionista: Fun With The Fishes! We went to play (and not sleep) with the fishes! 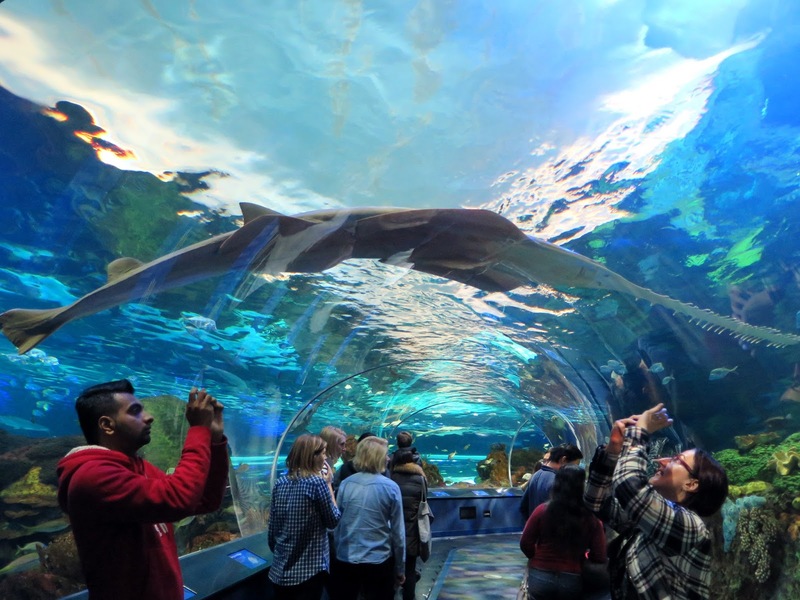 Ripley's Aquarium of Canada opened in Toronto in late 2013 and is one of three aquariums owned and operated by Ripley Entertainment (the other two are located in Tennessee and South Carolina). Everyone I knew who had been there had wonderful things to say about it, so Heather and I decided our birthday trip was the perfect opportunity to see what the fuss was about. The Aquarium is not a marine park like Sea World or Marineland and has no "performing" mammals. I have never been, or would ever go, to one of those places, and if you have seen the documentary Blackfish, you'll understand why. 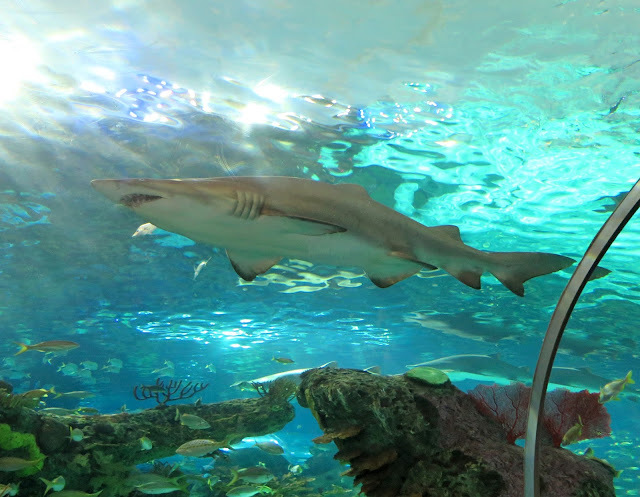 The aquarium has nine different galleries featuring various saltwater and freshwater environments from around the world. The first thing you see at the entrance to the "Canadian Waters" Gallery is a giant cylindrical tank full of small fish. 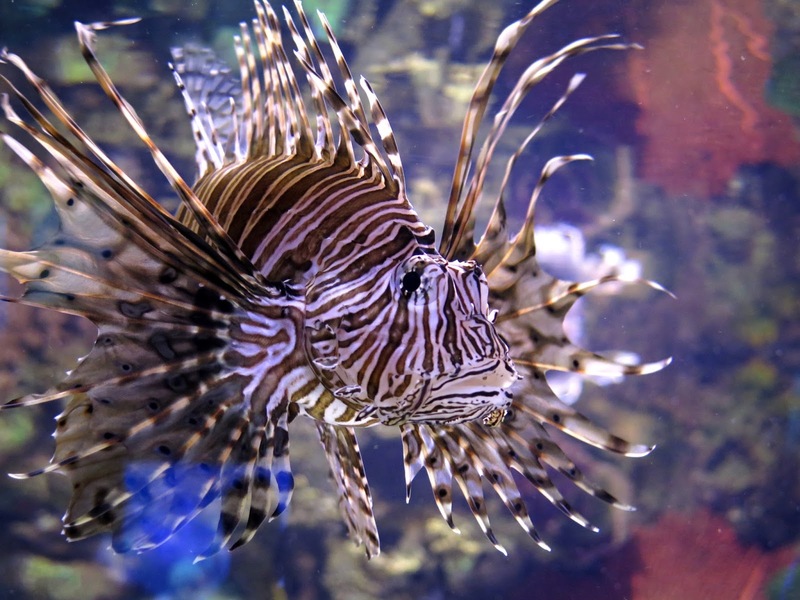 There were hundreds of them, and without warning, they would change direction as one unit. 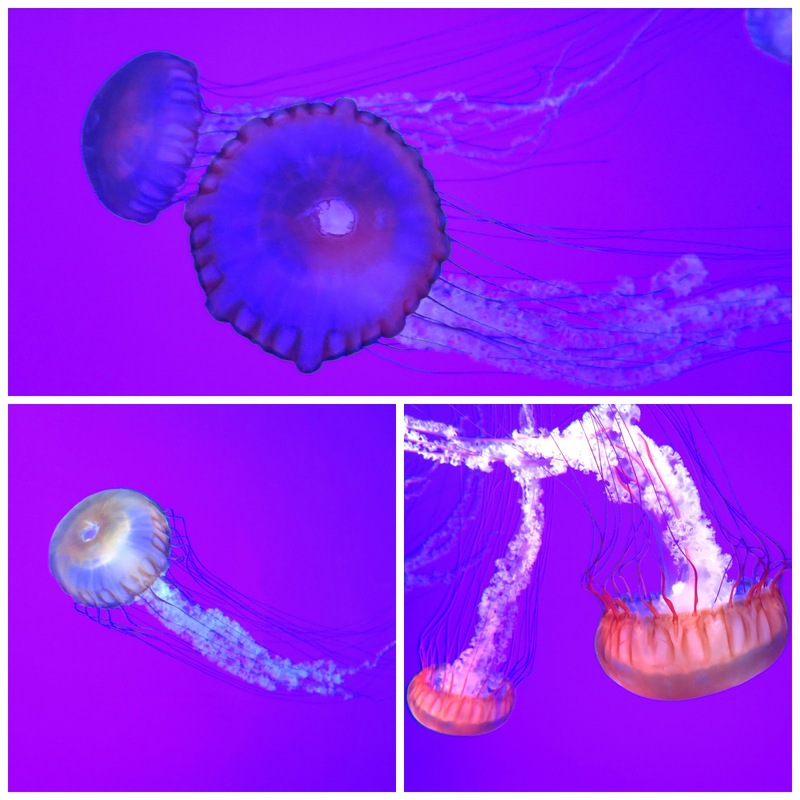 It was fascinating and rather hypnotizing. 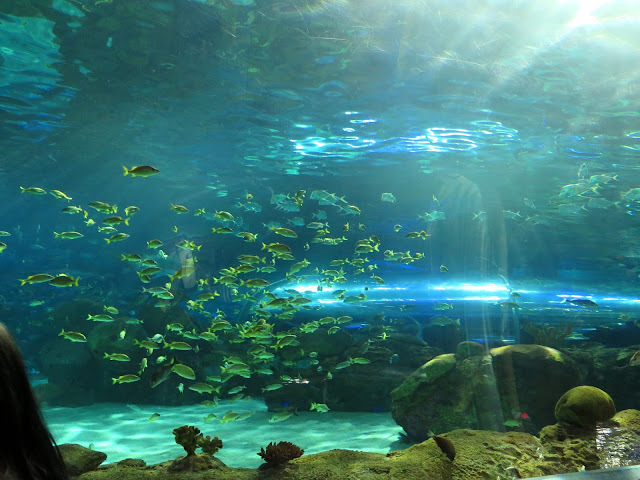 The aquarium is not very large, and can be covered in about two hours, depending on how long you linger in different exhibits. 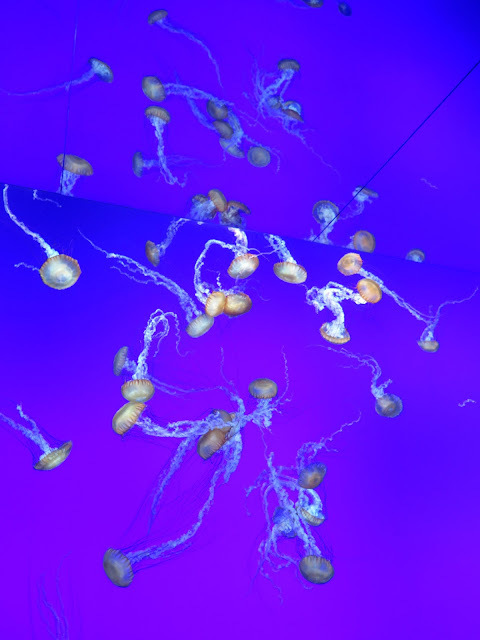 Except for the open area in the middle, it is also very dark, and because of the lighting in the tanks, very blue which gives it a rather other-worldly atmosphere. 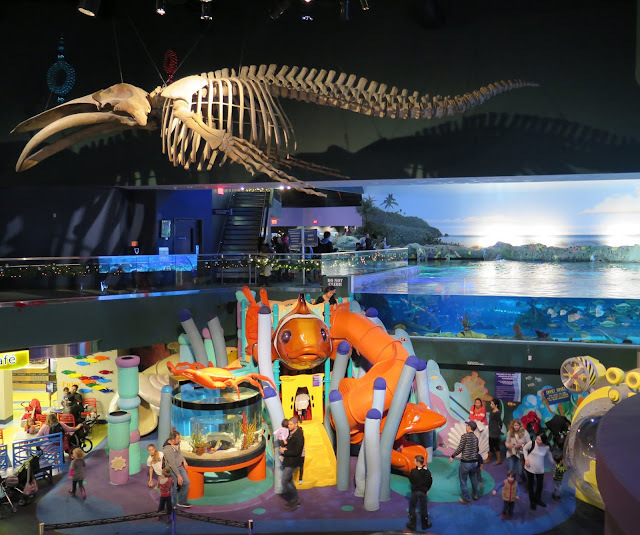 The Canadian Waters exhibit had the largest lobster I've ever seen (top right). That's his claw resting next to a regular size lobster. 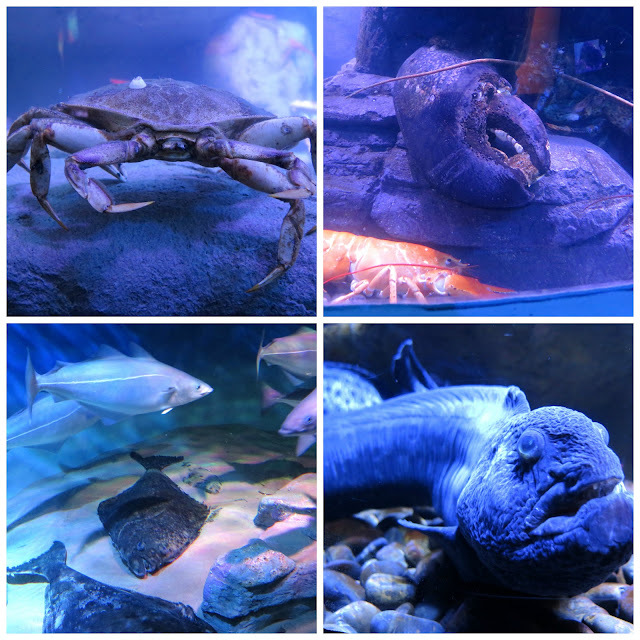 There were also some rather unpleasant looking creatures like the wolf eel (bottom right) and some large flounder-like fish (bottom left). 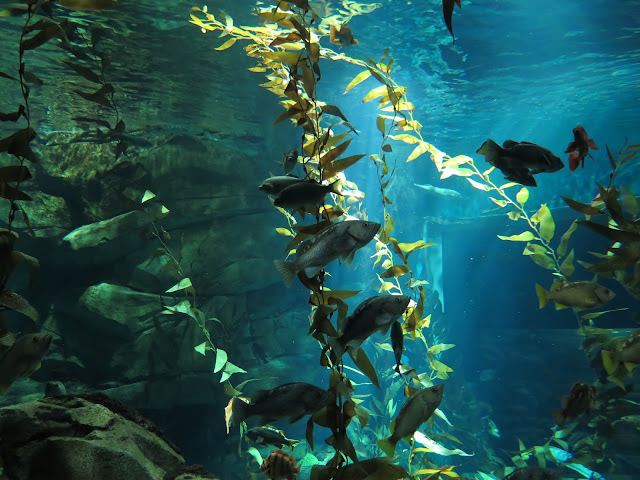 A giant two-storey tank recreated a Pacific Kelp "Forest", which included a wave machine that simulated the surging current of the British Columbia shoreline. 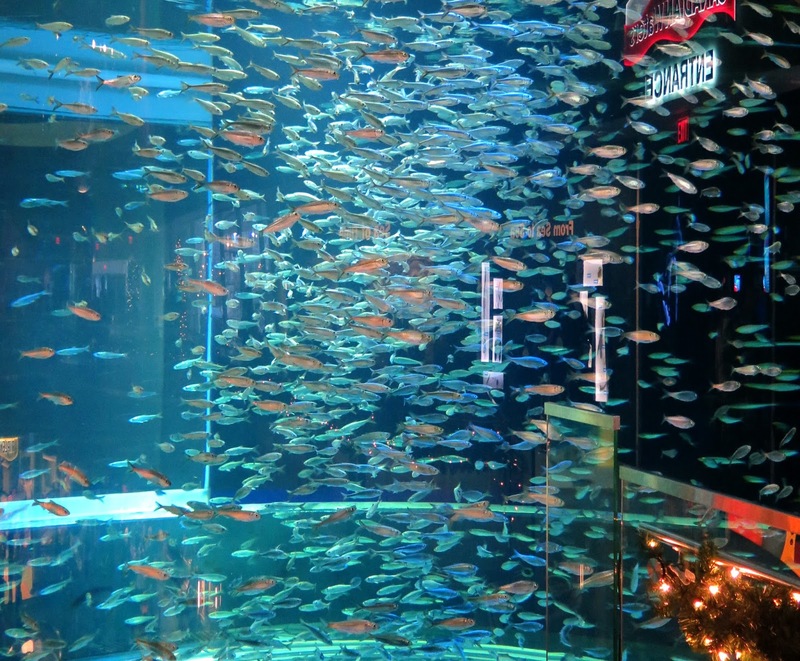 I stood in front of the tank for a while watching the up and down motion of the fish. If you were extremely stressed or anxious, I would think that time spent in front of this exhibit being very therapeutic. 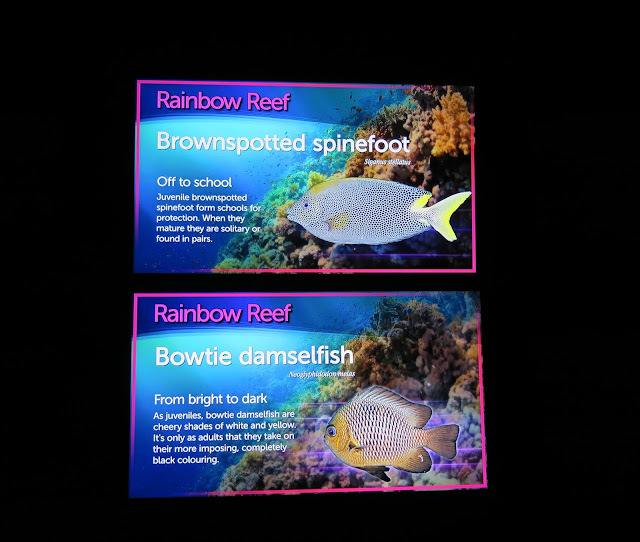 Illuminated screens provided details about the various types of sea creatures in each exhibit, but as the screens were constantly changing, and were not right next to the exhibit, it was difficult to figure out what the specific fish was you were looking at. The Dangerous Lagoon was the largest, and my favourite, exhibit. 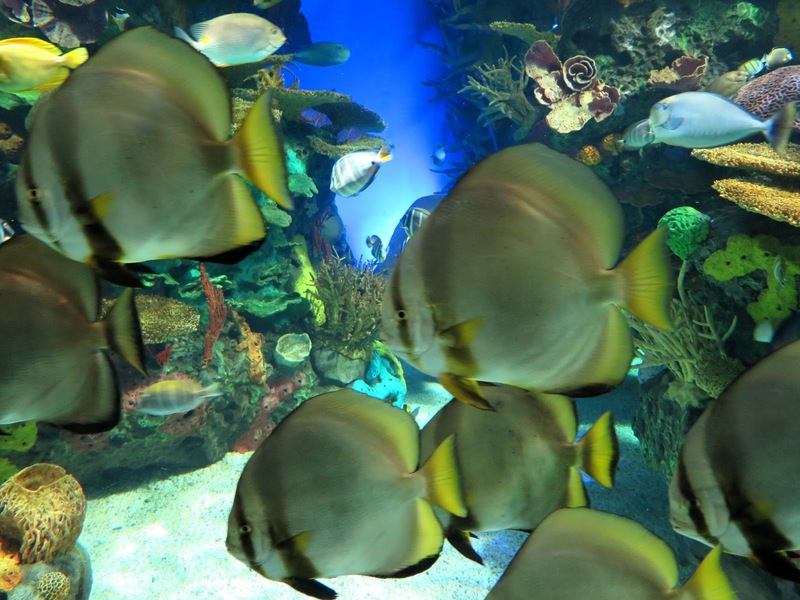 It contains nearly 2.5 million litres of water in which two kinds of sharks, roughtail stingrays, green sawfish, sea turtles, and other smaller fish swim. 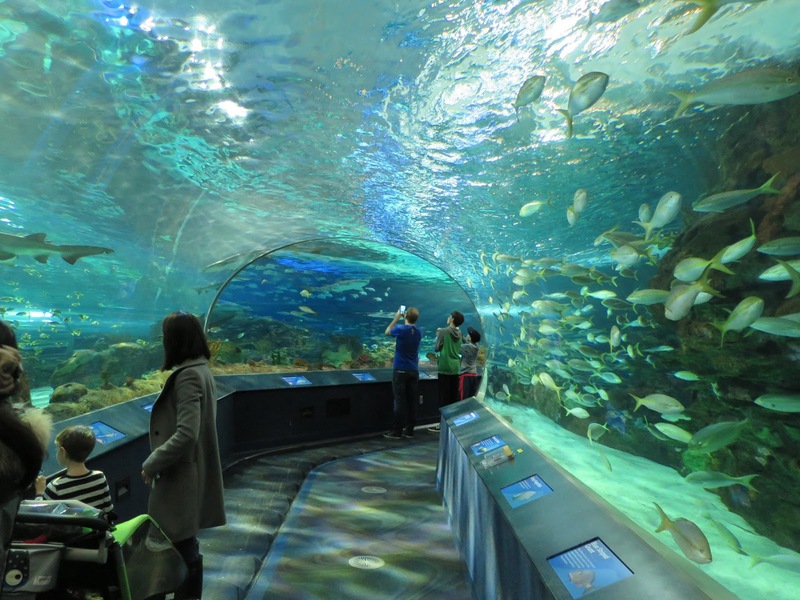 A moving sidewalk carries the viewer through the tunnel, or you can chose to walk on the stationary part of the floor. This giant green sawfish seemed to be relaxing across the top of the tunnel and remained unmoving the whole time we were in there. It was very strange having this primitive looking creature suspended overhead, so close you felt like you could reach up and touch its belly. With the light shining through from the top of the tank into the dark tunnel, and sharks swimming lazily all around you, the atmosphere was oddly dream-like. 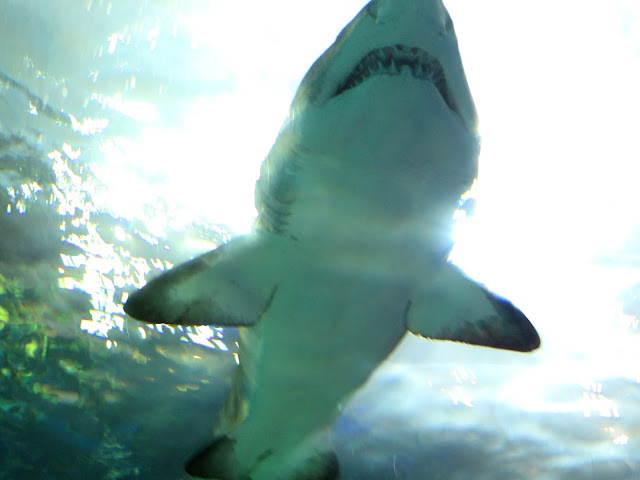 ....until one of them swam directly over my head, causing me to jump - more nightmare than dream! 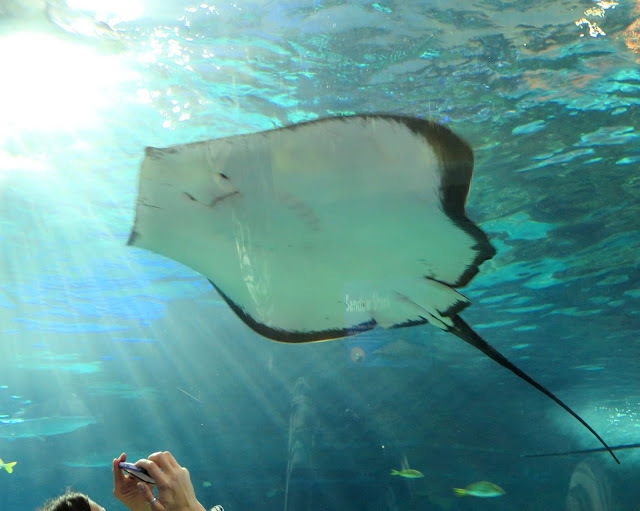 I was soooo excited to see Majestic Sea Flap Flaps (aka stingrays) up close, with their minimalist "faces". .....and the Leafy Seadragon. These must have been created during one of Mother Nature's abstract experimental periods. 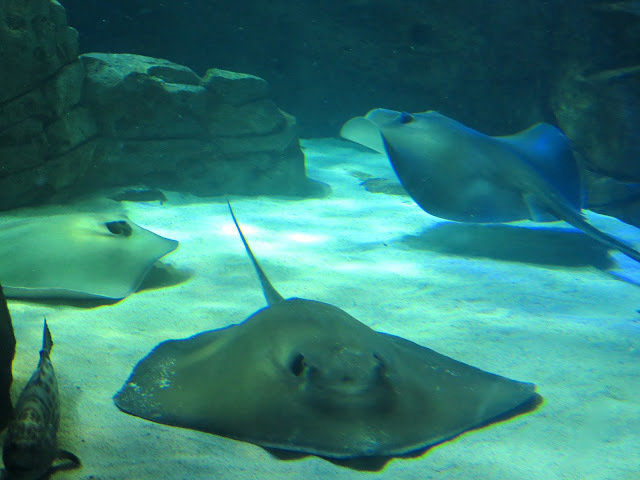 Ray Bay, featuring four different kinds of Stingrays, was incredibly cool. 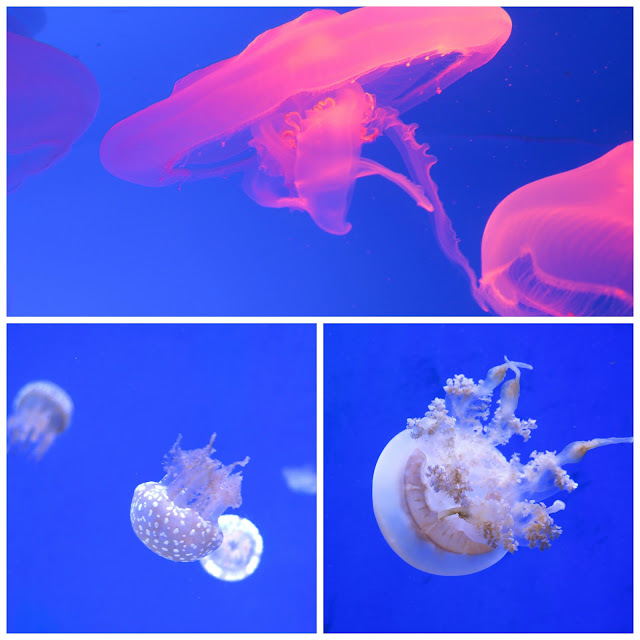 As corny as it may sound, I was filled with awe watching these graceful, primitive-looking creatures glide around their tank. In the Discovery Centre, both of us took the opportunity to mingle with some Clownfish (Nemo!) 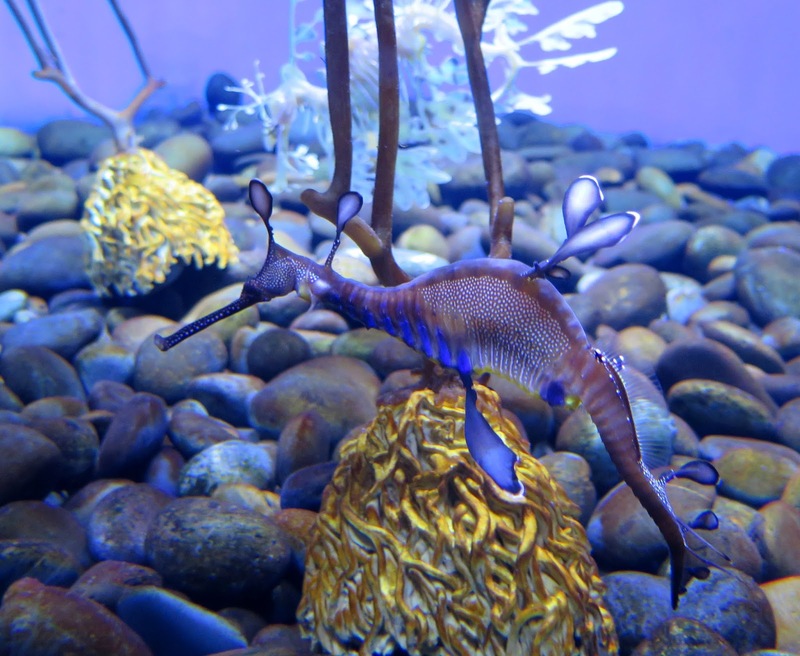 and touch a Horseshoe Crab (my photo in the "bubble" is at the beginning of this post). An entire wall, approximately 10 feet high, complete with mirrored ceiling, was full of Pacific Sea Nettles, propelling themselves through water that was backlit to appear a brilliant blue. Lighting effects also cause the nettles to constantly changed colour, and you really did feel like you were on another planet. I could imagine sleeping there, surrounded by a quiet kaleidoscope of colour. 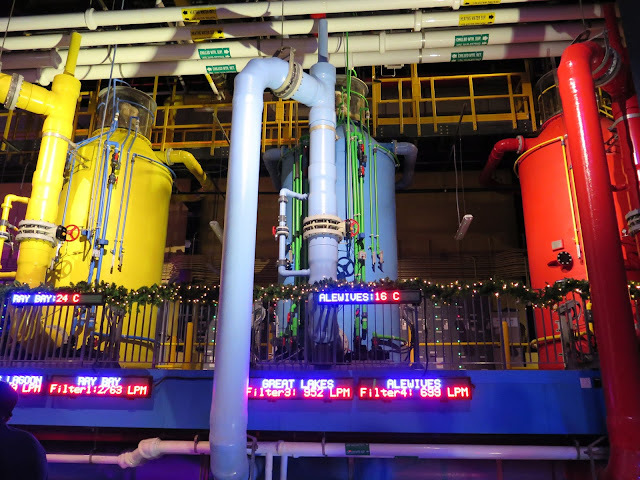 One of the last galleries was the Life Support Systems, where you could see the inner workings of the aquarium, and the tanks, filters, etc. necessary to control the various aquatic environments. 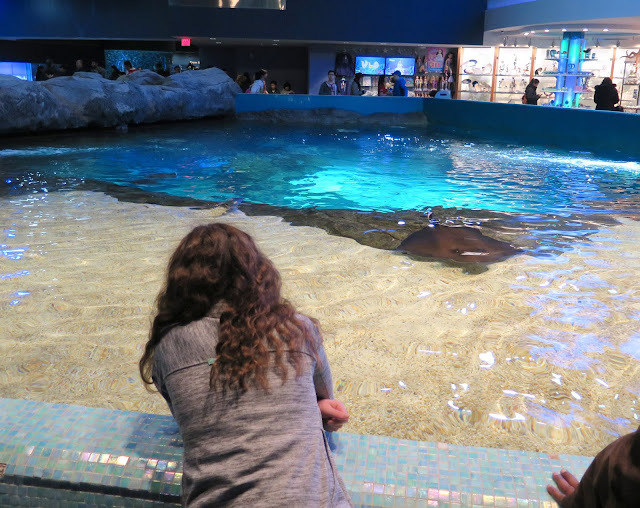 The Shoreline Gallery is located at the top of Ray Bay, and if you put your hand in the water, Stingrays will swim up from the bottom of their tank, close enough to allow you to stroke their smooth, slippery skin. 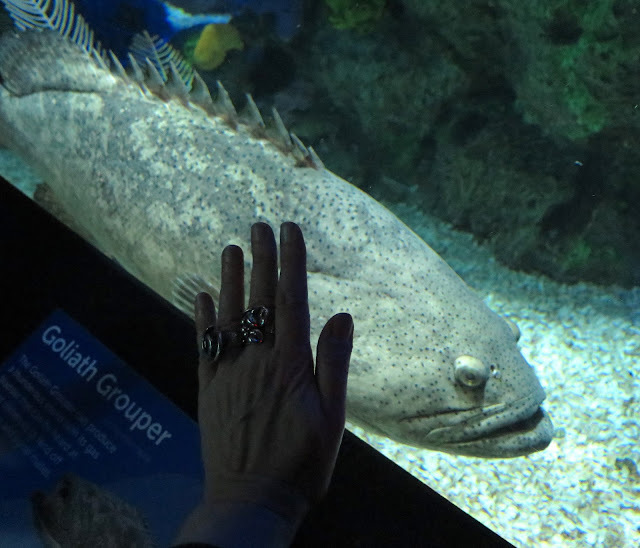 Heather and I both were able to touch a few of them, and I am not exaggerating when I say it was one of the coolest experiences I've ever had. My review? Two thumbs up and definitely worth a repeat visit! 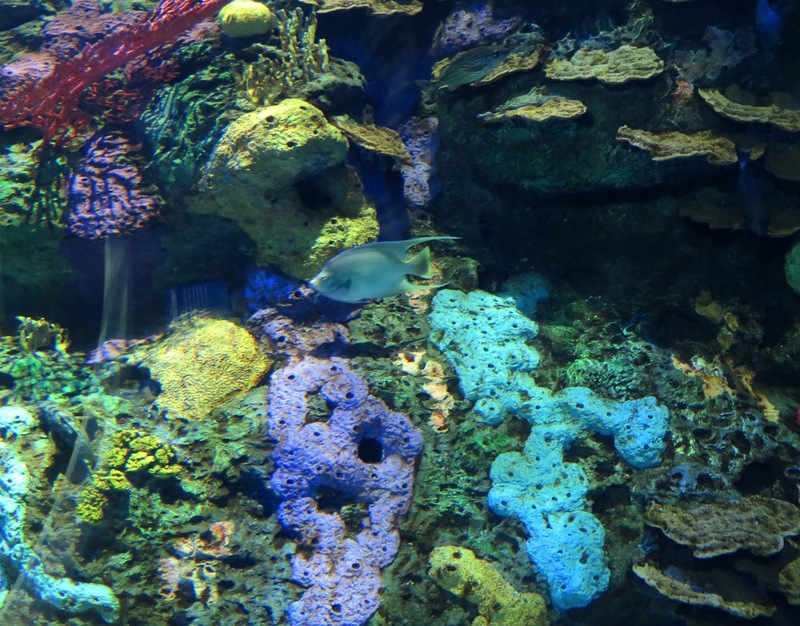 The Aquarium provides an entertaining and educational visual feast, for adults and children, and although the admission fee is rather high, we felt we got our money's worth. 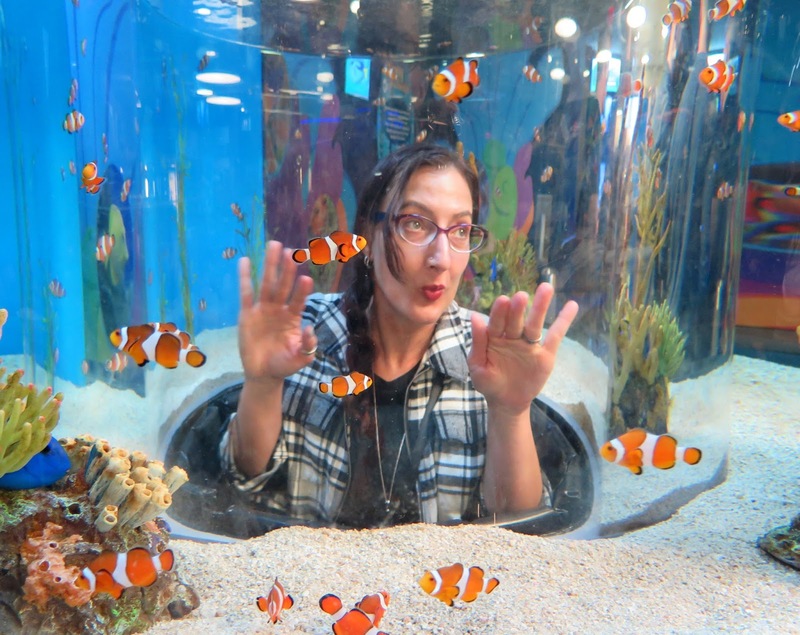 I know it's a real photo but even with Photoshop you couldn't have created a better picture of you (and Heather) in the bubble. Totally cool. That whole place is magic. I can imagine lounging there for hours. I'm surprised the rays don't mind being touched and am delighted by this cross-communication. Thanks for all these photos. Stunning! I grew up with Sealand of the Pacific, killer whales and sea lions performing, and octopi in tanks. I remember being awed as a kid, then horrified as I became aware of the conditions that these animals worked under - in my own city! I don't regret going there (I was a kid), but I'm glad it's gone now. That looks absolutely wonderful and all the better for not having any of those awful performances, downright cruel. Okay...you've convinced me. I want to go. I always associated Ripley's with tacky. I think I might need to reassess that. 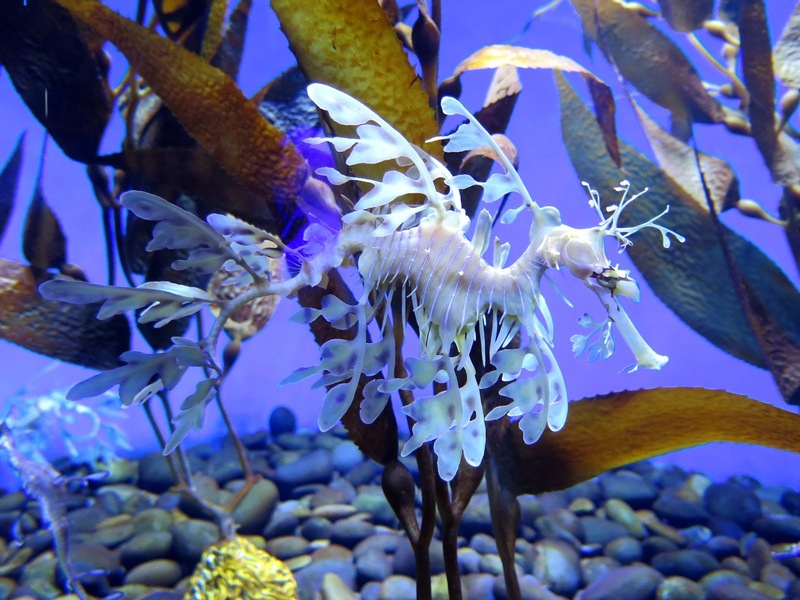 Wonderful review of a fascinating "must see" if in Toronto. The first photo of you in this post is one of my all time favorites. And that's saying something. In awe!!! What a totally cool post this is. Thanks Shelley. I have thoroughly enjoyed reading it and was in awe.